Well, I was right, the third beer was very persuasive and convinced me to battle on and check more machines. However, I’ve not had much joy, with the next three machines all exhibiting video glitches. The second and third of those are, I believe, booting the diagnostics disk, but the screen image on two separate monitors is patchy. It’s obvious it’s at the same menu system, it’s just that it’s actually illegible. I’m going to call it a night. I need to check whether the glitches are happening on the (now) known good europlus (motherboard 8237), as I’m beginning to suspect the monitor, monitor cable or even the PSU I’m using to test the machines with. Troubleshooting where the issue is will have to wait for another day, though – probably after the weekend. At least I’ve gotten something done, so my conscience will rest easy tonight. As per my Retrochallenge 2016/10 Half Time Report, I hadn’t had much luck firing up my new favourite europlus, even after replacing the 6502, the ROMs and several logic chips. 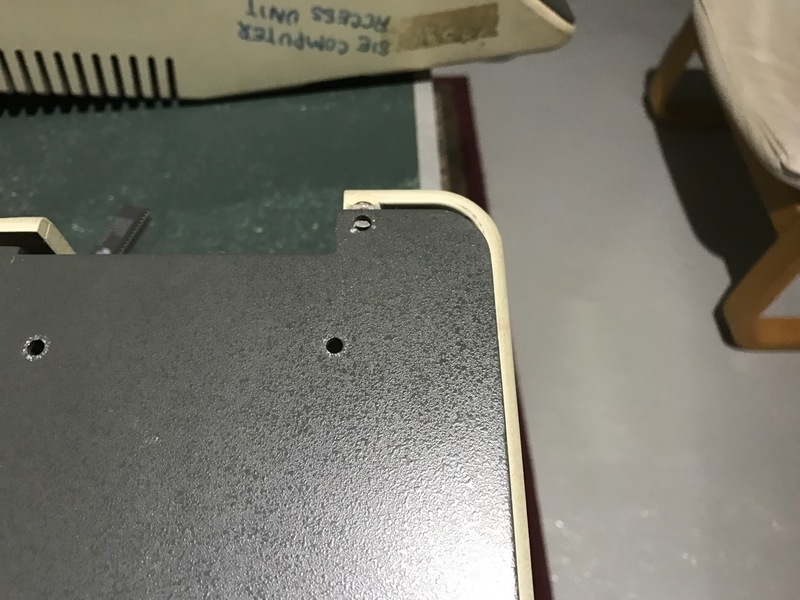 A couple of nights ago I decided to press on with the next machine along on the table tennis table (motherboard 8109, see my Updated Census)…and didn’t get much further. Similar issues to my early motherboard – no boot or garbage on the screen. This is one of the two I picked up during my Retrochallenge Roadtrip, and is the one with a funny case, umm, “adjustment” (read “butchering”) around the keyboard and a missing PSU, so maybe it was only being used for parts or was a “project”. I’m not doing deep analysis of the faults at the moment, I haven’t had the time. But, there I was this early Friday evening, listening to the RCR Podcast Episode 139, enjoying a quiet beer with machines behind me screaming for attention and feeling guilty about not doing much on my entry while Head Judge John Linville is saying kind things about my blog posts in his half time report (apparently, I’m a “pace setter” – let’s not talk about what pace, however). So I thought I’d check the next machine along, motherboard 8237. So, that’s a win (albeit an admittedly small one). Given I’m now enjoying my second quiet beer, I question the wisdom of doing any more Retrochallenge-related work tonight, but I’m sure the third (possibly) quiet beer might talk me ’round. Let me know in the Comments below what alcohol-fuelled work you’re getting to in your Retrochallenge entry (you did enter, didn’t you?!). 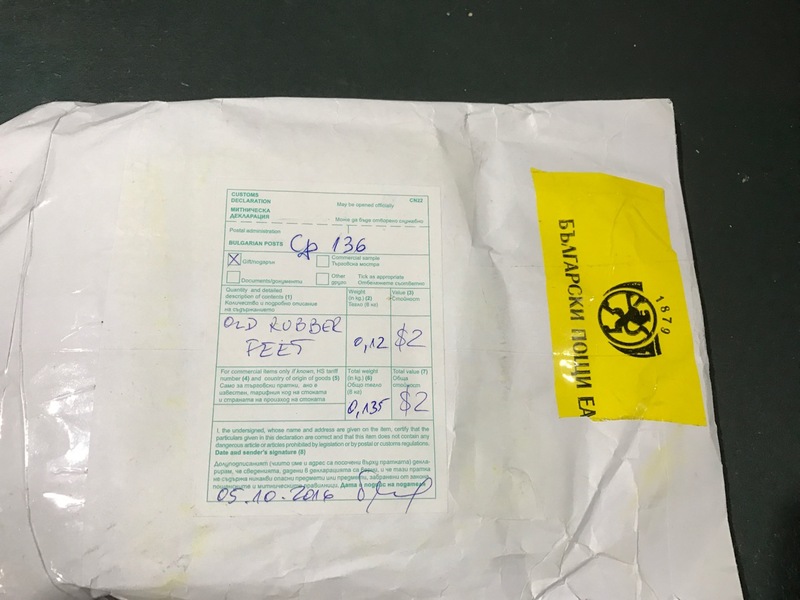 A parcel arrived from Bulgaria today: 36 rubber feet to replace those on the bases of my europluses. I bought enough to do nine bases – so I’ll have plenty for the six europluses I’m hoping to totally refurbish and make complete. Some of the existing feet are missing, some have been replaced with screw-on ones, and some have just migrated over time like some weird micro-scale (Ha! see what I did there?!) continental drift. I’m planning on removing all the original feet, cleaning the bases of all adhesive residue, and “installing” four feet per base. The match is pretty good (see Figure 1) – they were advertised as NOS Apple feet, but, given the slight differences, they’re either (likely) later versions than europlus-era, or ones which just happen to be very similar. 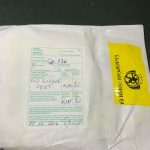 Funnily enough, I’m expecting another Apple ][-related delivery from Bulgaria, but the highly appropriate goods description (see Figure 2) on the customs declaration put paid to any thoughts of having hardware to play with before I’d even opened the package. I hope you get to do more on your Retrochallenge entry this weekend (you did enter, didn’t you?!) than I’m expecting I’ll get to. Figure 1. Rubber feet match against original. Figure 2. Appropriate description is appropriate. And you run and you run to catch up with the sun but it’s sinking, racing around to come up behind you again. The sun is the same in a relative way but you’re older – shorter of breath and one day closer to death. Well, one day closer to the end of Retrochallenge 2016/10, anyway. 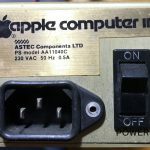 I opened three of my PSUs to check a part number for Mark Cummings, a fellow Australian enthusiast who is working on schematics and parts lists for Apple ][ power supplies – he and Dean Claxton have already released details of the 240V DynaComp PSU used in the Apple //e (primarily the Enhanced //e). The other three PSUs will need the pop rivets drilled off, and I just haven’t gotten to that task yet. But I’m that little bit closer to testing the PSUs’ capacitors. I also put one of my new Synertek 6502s into my new favourite europlus, as well as an NE558 chip which was missing from the motherboard and tried to boot it up. It’ll definitely need more work – it was crashing out of the CFFA3K boot menu, displaying rubbish on screen, repeatedly crashing to different memory addresses and the cursor even looked odd. In the end I had to set the Apple ][+ Dealer Diagnostics Disk image as the boot image on another machine. I then was able to boot into the diagnostics software, and I could move around the menu options on that disk via the ESC key, but I couldn’t press Return to run the selected test. Just as well I’m old and remembered that the Control-M is an alternative way to get the Carriage Return character – it worked! 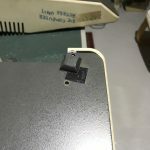 So there may be a problem with the Return keyswitch. Doing the ROM test said to replace the D0 Applesoft ROM, so that’s another repair task. I’ll try and get to that and cracking open the rest of my PSUs by the end of the week…but that sun is already sinking, racing around to come up behind me again! I was reasonably settled in thinking, going by serial numbers, that I had mid-age to very young europluses (see my europlus Census). However, my realisation that there was a lot of variation in the motherboard green colours led me to look more closely at them all and I realised that one motherboard had dark green (rather than black) slots with feet with fixing screw holes…and that got me looking at that motherboard more closely still (see Figure 1 below). That motherboard is the only one without a date code – in the usual location it has written on it “APP031” (or “APPO31”). 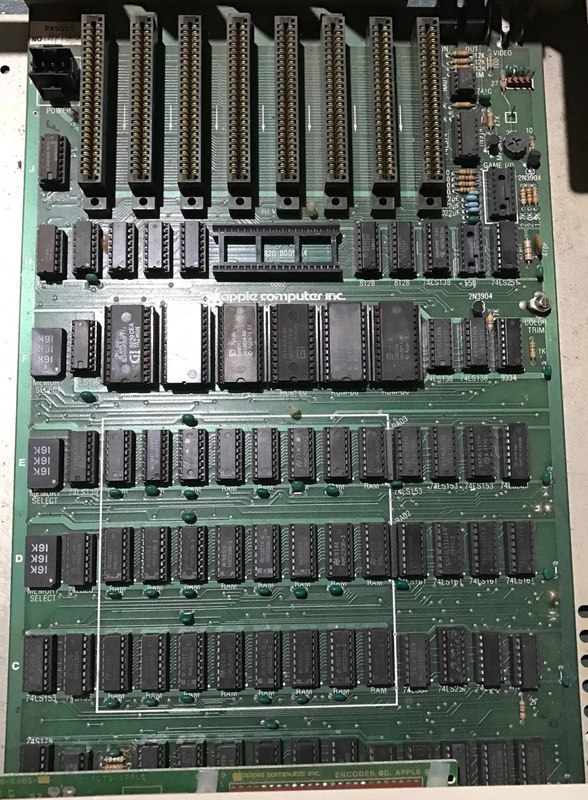 It also has the memory select blocks common on early revision motherboards, but it’s one of the three motherboards with a 65C02 I had incorrectly replaced the original 6502 with years ago, so I couldn’t check the date code on the original CPU. I keep everything…I admit it, I’m a hoarder. I knew I had two of the three replaced 6502s in the antistatic tube my last unused 65C02 was in. 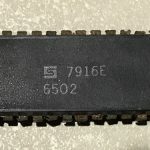 Their date codes were 8135 and 8243, which seemed consistent with the date codes on the other 65C02 motherboards in 700105 and 667843 (4182 and 5182 respectively). But I was sure I wouldn’t have only kept two of the three replaced 6502s, and I had a vague recollection of a loose 6502 in one of my small plastic boxes. Luckily, I knew where that box was, and when I checked, bingo! There was a 6502. And oh, what a beautiful 6502 it was. Bent pins. Missing pins. Corroded pins. But, oh…that date code! For a europlus, that is early. From what I’ve read, europluses were available from June 1979, and were manufactured until December 1982. Given the style of motherboard, such an early CPU, and the number 31 as part of the writing where the motherboard date code should normally be, could it actually be a 7931 motherboard? This site says the board’s revision (Revision 3, part number 820-0001-04 visible under CPU) was in production from roughly 7934 to 8030, so we’re in the ballpark. 7931 would be a manufacturing date in late July 1979. You wouldn’t find many surviving europluses that old. And I’ve got a 5182 motherboard – one of the last/youngest – along with several in between those two. The completist in me is quite satisfied with that sort of mix. I knew other chips, such as memory chips, also have date codes on them, so I investigated their date codes…my heart started to sink a little: 8251, 8325, 8211, 8134 – these were not uncommon date codes I was seeing. But I kept looking, and found others such as 7928, 7926, 7930, and one ROM’s date code of 7919. I think at some point, probably in the early 1980s, this motherboard was refurbished with then-current components. Maybe it was even combined with the machine which originally had the serial number 669150 (which is the serial number on the base), as that’s right in the mid-range of serial numbers. On that basis, I’m going to re-unite this early europlus motherboard with the early europlus base plate that I got during my Retrochallenge Roadtrip (614494) – I may also have an early keyboard and keyboard encoder that were with that early base plate, but that’s an investigation for another day. I’ll then have an early europlus as part of my collection, which is a very nice feeling. I’d be interested to hear what unexpected discoveries you’ve made in your collection in the Comments below. I think this tabulation of date codes is going to become the most tedious part of my Retrochallenge entry – but I’m using the fact I’ve entered Retrochallenge to push past the tedium and just get it done. Having the data and then using it to align the various components will satisfy some deep OCD tendency within me, so apologies to those who were hoping for more Magic Smoke™ and soldering. 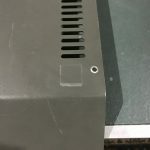 The “PSU Stamp” is punched into the metal on the side of the PSU near the motherboard’s power molex connector and is on all of the PSUs…except the highest serial numbered PSU, which is also the only one with a date code anywhere externally. See the Figure 1 below for a stamp example and the sticker. 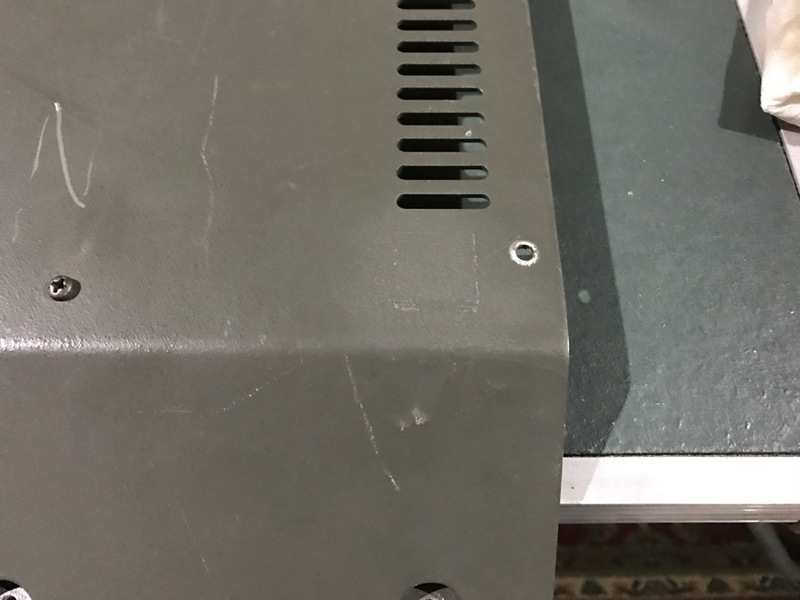 The number listed under “PSU Stamp” for that PSU and the date code is on a sticker in the same location as the other PSUs’ stamped number. 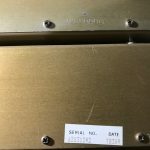 The sticker has a dot matrix-printed serial number and date code (and the serial number is different to the number on the main label). 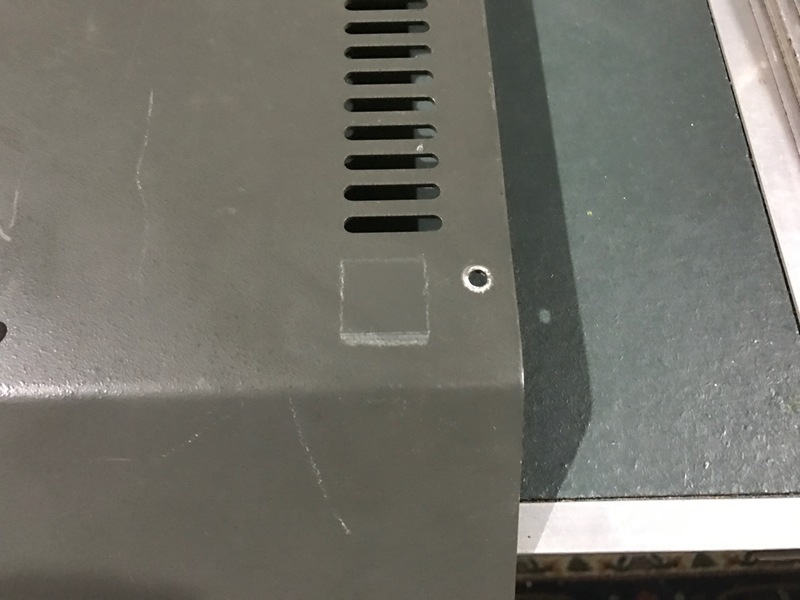 This sticker looks very much like the stickers on the silver //e PSU. 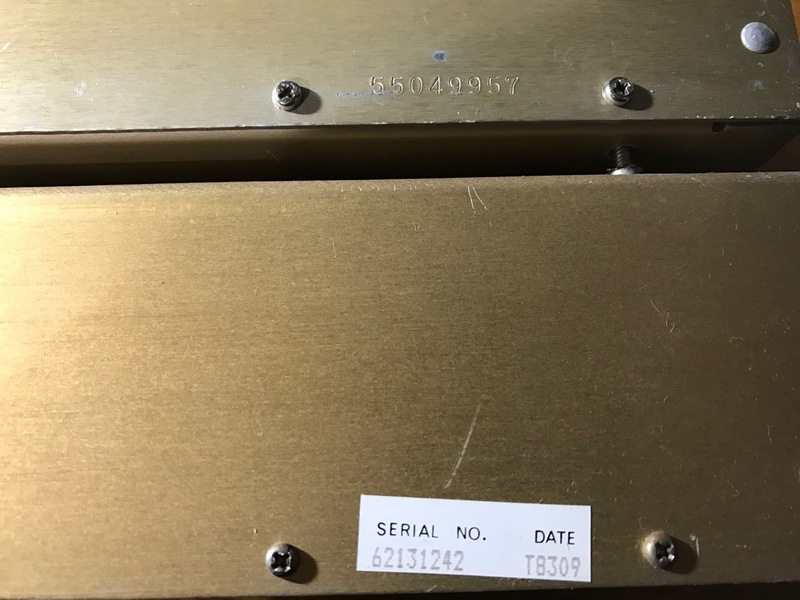 I don’t know what the stamped number and sticker serial number represent vs the serial number on the PSUs’ main label, and would appreciate any info on that in the Comments below. 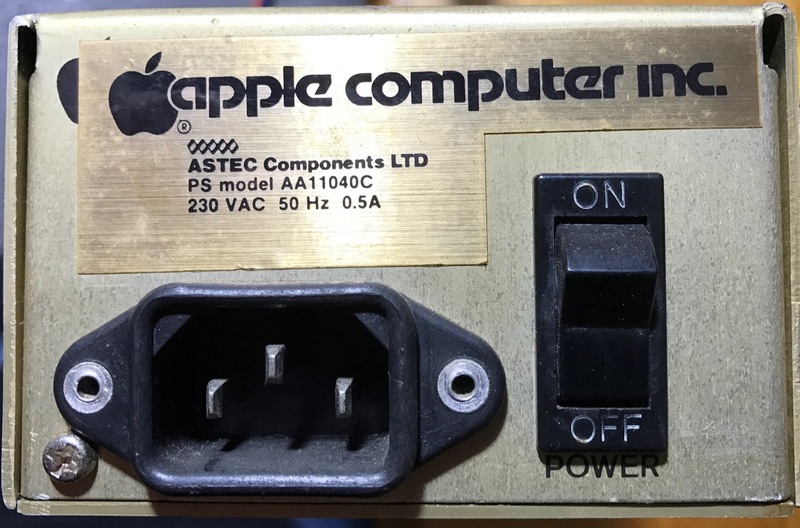 Another external difference is that PSU 160082, which is the only PSU with a stamped number not starting with “T” (see Figure 1), has a sticker at the switch end with the Apple logo and product details (see Figure 2 below) – I wonder if this was from a batch of 110V cases they repurposed for use on 230V units? 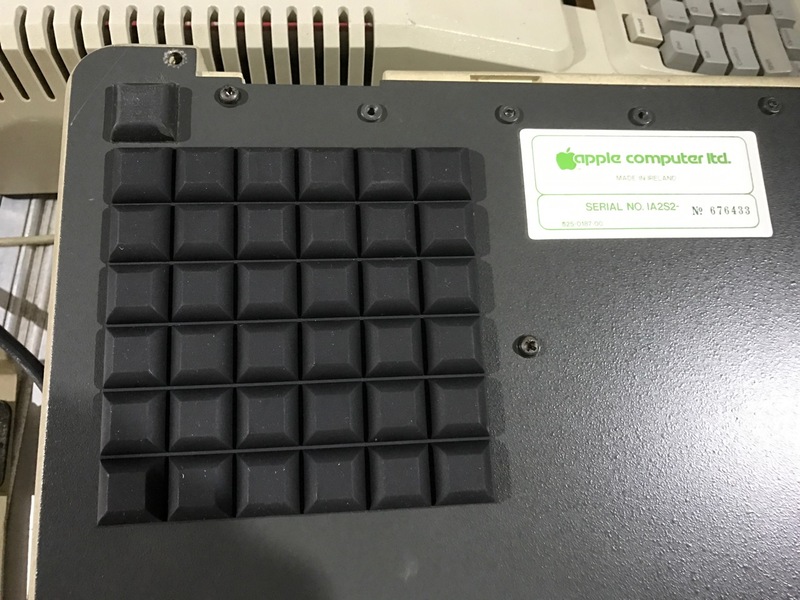 I’ll be looking for date codes elsewhere inside the case, but I suspect there won’t be any – there are certainly none obvious on the spare keyboard and keyboard encoder card I have, so I won’t be doing a census of those (“Hooray!” I hear you say). 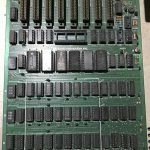 I will be, however, comparing the date codes of chips on the motherboards vs the QA date code hand-written on them so I can see if I can come up with a rule of thumb and estimate a date for the un-dated motherboard (in the currently lid-less 669150 case). It may just come down to the 6502 date code vs the QA date code if that seems consistent. Have you ever done a refurb like this, documenting such minutiae as you go? I’d be interested to hear about it in the Comments below – primarily so I can see if I’m the only freakperson in the world who would do such a thing. Among the changes beyond adding the two new machines, I have assigned the base plate I sourced from Jeremy with serial number 614494 to the machine with the label-less base plate, and I found the PSU for 671330. 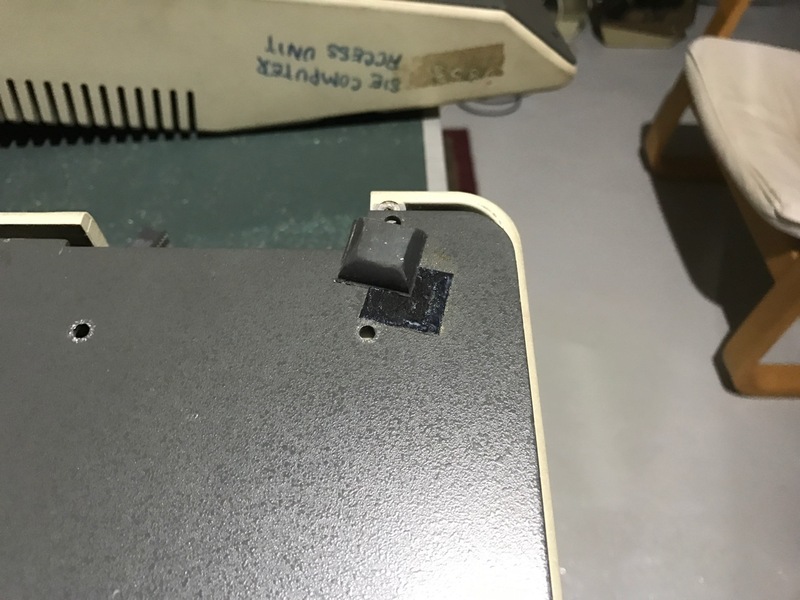 676433 has had its case modified around the keyboard – it looks like it was meant to move the keyboard 3cm to the left and leave a 6cm wide gap for something(?) to the right of the keyboard. I originally thought it was for a numeric keypad, but 6cm isn’t wide enough. 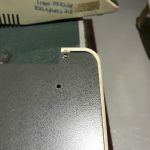 It also has a 9-pin D-SUB connector at the top of the keyboard encoder card – the other machines’ keyboard encoder have a screen-printed outline for a connector there, but no notation. If anyone has any clues or pictures of these two mods from back in the day, please let me know in the Comments below. I’ll try and do dome searching when I’ve recovered somewhat, but I would not reject a shortcut to the info. What this all means is I may end up with six functional machines – I’ll likely move 676433’s lid to 669150 (which is lidless/wrongly lidded), not bother getting another PSU, and have spare parts from 676433’s motherboard (or swap the motherboard into one of the other cases). 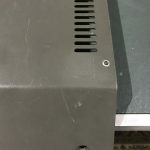 While I’d rather have seven fully functional and complete machines, sourcing a spare PSU, lid and unmodified top case may not be feasible (without getting a whole extra machine, which would leave me with the same remainder of parts), so I guess I’ll have to be satisfied with having spare parts for six. I already had a clone motherboard for parts, and Jeremy has lent me another clone motherboard, a europlus keyboard, and a keyboard encoder card for spare parts as well. I’ve not done much actual work (driving for 7+ hours doesn’t quite count), and I’ve now got more work to do! And we’re almost a week in…phenomenal! I wasn’t really expecting to go any further than the local Jaycar Electronics store for new capacitors as part of my Retrochallenge entry. I certainly wasn’t expecting a 650km round-trip roadtrip, but that’s what I find myself undertaking today to expand my europlus Refurbapalooza. The main purpose of the trip is to pickup two europluses I’m adopting – they normally live 1700km north of me in Townsville, Queensland. Their current owner, Chris (who donated an EDD+ card to me for disk imaging work), is visiting our national capital, Canberra, so I thought a day’s roadtrip early in the month would allow me to include these two machines in my entry. I’m going out of my way as Chris is gifting them to me – I couldn’t really expect him to drop them off as well! One machine is missing a PSU, and the other’s operational state is unknown. I’ll post an updated census once I have them all at home. While in Canberra, I’m also picking up a europlus case base with original sticker I’ve acquired (thanks, Jeremy!) – one of my europluses is missing its label, so it’ll be nice to have labels on them all by the end of Retrochallenge 2016/10. The machines are already a weird mix of date codes vs serial numbers, so I’m taking the liberty of grabbing this serialised base for the label-less europlus. Hopefully, that’ll be the bulk of my Retrochallenge travelling done for the month – at least it won’t be said I didn’t go the extra mile (or 400 miles) for my first Retrochallenge entry! 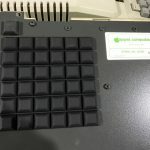 Let me know in the Comments section below the furthest you’ve gone specifically to pick up gear for your retrocomputer collection.